Remember RoyGBiv, the mnemonic for remembering the colors of the rainbow? 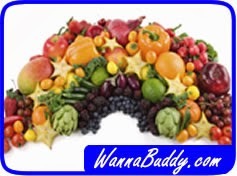 Let the rainbow help you remember these foods that can help fight the effects of growing old. So here we go: red, orange, yellow, green, blue, indigo, violet. Oh, but remember, there is NO blue food. Red is for tomatoes. 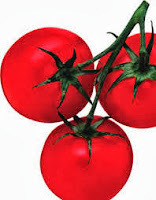 It turns out that tomatoes are rich in lycopene. Lycopene helps your body produce a protein called pro-collagen that helps keep your skin elastic (fighting wrinkles) and avoid sun damage. Orange? That has to be carrots. Carrots contain beta-carotene for regenerating skin cells and fighting wrinkles. Just don’t eat so many of them that your fingernails discolor. Yellow can be peaches or apricots, your choice. Either one gives you essential vitamin A for soft and moist skin. Green? Olives, of course. Olive oil counts, too. Lots of antioxidants to keep your body cells healthy. Blue! Remember George Carlin: there are no blue foods. Blueberries are purple, so there. Indigo? I chose blackberries. Not only delicious, they are chock full of antioxidants and vitamin C. Remember the Nobel laureate Dr. Linus Pauling? He was certain that vitamin C could cure pretty much anything. Violet is for blueberries (see blue). Fights inflammation and promotes healthy skin. Antioxidants and vitamin C abound. Plus, they’re cute when you sprinkle them over your cereal. Remember this somewhat tortured rainbow when you next go shopping. Eating these foods can delay the onset of aging’s more visible signs and keep your insides as healthy as your outsides! Thanks, Roy!